I've been trying to get back in the habit of reading fiction by reading a little bit before I go to sleep at night. My friend Philip brought me multiple books to read while I was in the hospital, but I was unable to read novels while on the pain meds- so I'm just catching up on those now. 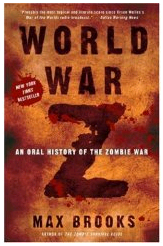 One of the books Philip gave me was World War Z: An Oral History of the Zombie War. I'm surprised to find that I really, really like it. It is structured like a well-oragnized series of interviews with survivors of the Zombie war. The level of detail author Max Brooks goes into in how the world reacts to a Zombie plague is fantastic and very, very smart. I didn't always like Zombie fiction, but E. Parker got me to watch some classic Zombie flicks and I enjoyed 28 Days Later (as well as 28 Weeks Later, though not quite as much). What most fascinates about all of these isn't the horror of bloody, slouching, you-eating monsters that used to be people. What fascinates is the guessing at what shape reactions would take. What'd happen to law, government, the military, the economy? How reasonably could such a plague be contained? The book is loads of fun. Thanks, Philip! If the Beatles Wrote "Stairway to Heaven"
R.A. Heinlein on "This I Believe"